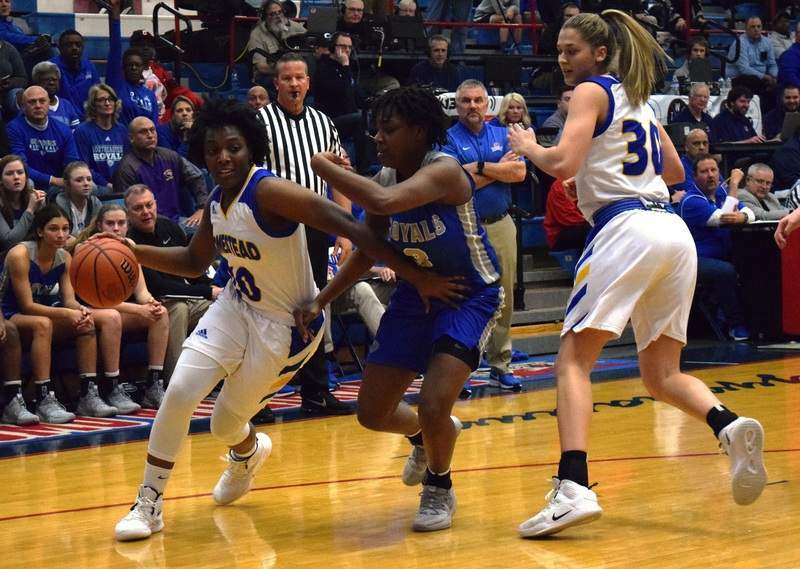 Elizabeth Wyman | The Journal Gazette Sylare Starks drives around Hamilton Southeastern's Malea Jackson in the first half of Homestead's 4A regional championship loss Saturday night. Elizabeth Wyman | The Journal Gazette Sylare Starks drives to the basket in the first half of Homestead's 4A regional championship loss to Hamilton Southeastern Saturday night. Elizabeth Wyman | The Journal Gazette Kara Gealy drives to the basket in the first half of Homestead's 4A regional championship loss to Hamilton Southeastern Saturday night. KOKOMO – The regional round is set up to be a challenge. Two games in one day is tough enough. But playing a double overtime game and then battling for a regional championship against the No. 1 team in the state seven hours later is a new kind of uphill battle. Those were the cards the No. 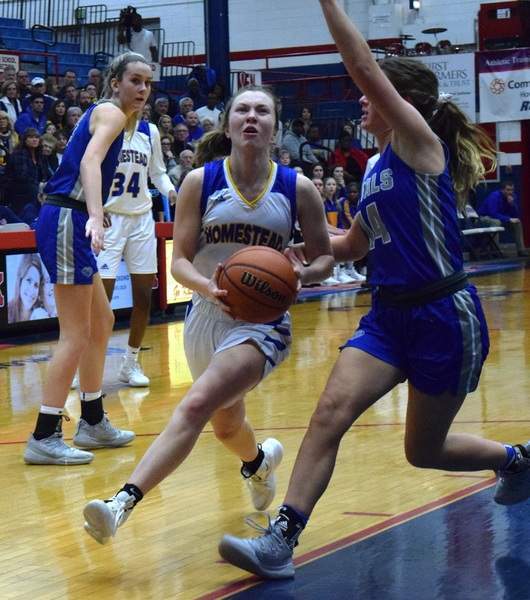 5 Homestead girls were dealt and as the fatigue set in, Hamilton Southeastern took advantage and defeated the Spartans 57-47 to win the Class 4A Kokomo regional championship Saturday night. 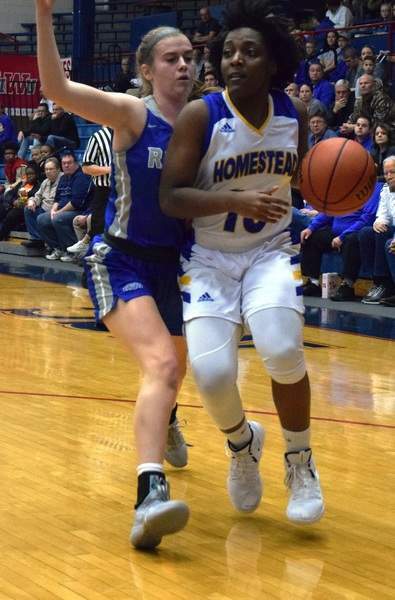 "Going in I didn't want to think or admit that it might impact us a little bit, but I honestly thought there were times we were a little bit sluggish, tired and just didn't seem quite as fresh as Hamilton Southeastern was," Homestead coach Rod Parker said. It didn't help that while it took Homestead 40 minutes to beat Zionsville 66-65 earlier in the day, Hamilton Southeastern blew past Carroll in the regional semifinal 59-34, resting many of its starters for much of the second half. "It did set in a little bit in the second half; our legs started to break," junior Rylie Parker said. "It was tough, but something we had to come through." After falling behind 12-4, the Spartans (26-5) found their rhythm and closed the quarter on an 8-2 run. Freshmen star Ayanna Patterson beat the first quarter buzzer on a tough post move for two of her team-high 15 points. She also had 10 rebounds. "I just played my game," Patterson said. "I do what I can to make something happen." Parker said that Patterson showed immense growth in the loss alone. "I think one of the big things I really liked today is she really stepped up in trying to make the plays and that was very important," Parker said. "For a freshmen to have possessions where she wanted to take charge, that was a sign of maturity." Hamilton Southeastern's Sydney Parrish dominated the game. She went 9 of 15 for 27 points and had the Spartans stumped. "Sydney Parrish made some absolutely huge shots when she had to," Parker said. "She's a great player and she controlled the tempo of the game." Facing a 31-25 halftime deficit, Sylare Starks hit a baseline jumper to pull Homestead within 39-37 late in the third quarter. But then fatigue set in for the Spartans. The Royals (25-1) opened the final quarter on an 8-0 run, paced by a deep Parrish 3-pointer to go up 10 with 4:49 left to play. The Spartans graduate seven seniors, including starters Starks, Kara Gealy and Haley Swing. "A lot of the girls I've worked with since they were in third grade, so it's been a long ride," Parker said. "We've won this thing a few times." While the regional championship win didn't happen for the Spartans, they did win their fifth sectional title in sixth years. And with players such as Patterson, Sydney Graber – who had 11 points in the loss – and Parker back next season, the Spartans look to be in good shape. "Hopefully they'll be hungry in the off-season to work hard and put themselves back in a position to be in this game again," Parker said.